With obesity and diabetes rates on the incline across the world these days, and with 80% of what you can buy in the supermarket falling into the category of fake or genetically modified food, why not just say to hell with it all?! Soon you can just go to Krispy Kreme and simply drink a doughnut from a cup. YES, isn’t that just the icing on the cake? Throw caution to the wind, regardless if they’re Halal or not (are they even fried in pork fat? ), because they can be quite tasty at times, but how about drinking it in liquid form? Hmmm, would Rocky Balboa do it like he cracked a couple liquid eggs into his blender for that all important breakfast meal on the go? We don’t know, but some people eat Krispy Kreme’s for breakfast, you know? So, this latest concoction from Krispy Kreme will surely go down a treat, if this is your idea of something eatable in drink form. 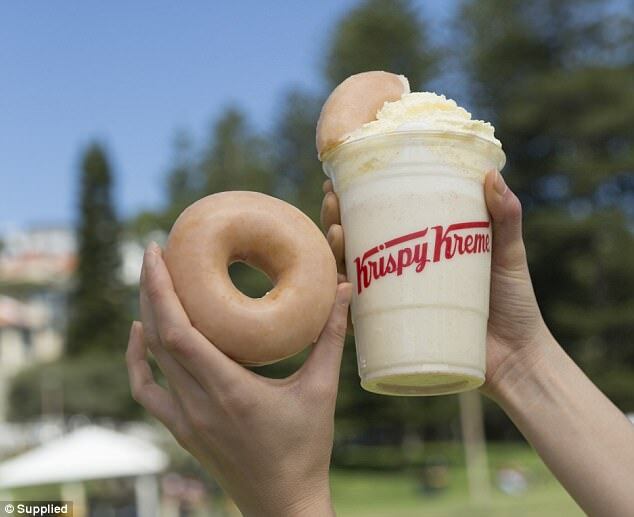 Yes, they’ve thrown in an Original Glazed doughnut into a drink, just in time for summer in Australia this year, with lashings of vanilla ice-cream, fresh milk and syrup, all rolled into the mix. Don’t forget all that whipped cream on top, too. Can you say Diabetes? It also comes in two additional flavours of Kookies ‘n’ Kreme and Choc Honeycomb. Some of us would consider a doughnut as a one-off treat nowadays, since long gone are the days when you would buy a box of twelve with a good conscience, devour four in about four minutes, then regrettably complain about how you look fat afterwards. These Krispy Kreme shakes will be all the rage for some people, with all three flavours available down under today. Kookies ‘n’ Kreme is served with chocolate cookie crumble and pieces of chocolate cookies, and the Choc Honeycomb is flavoured with chocolate covered honeycomb pieces, and topped with a honeycomb crumble. Throw the whipped cream on top and what do you have? Burgeoning obesity, that’s what you got. Least if you drink too many of these bad boys! 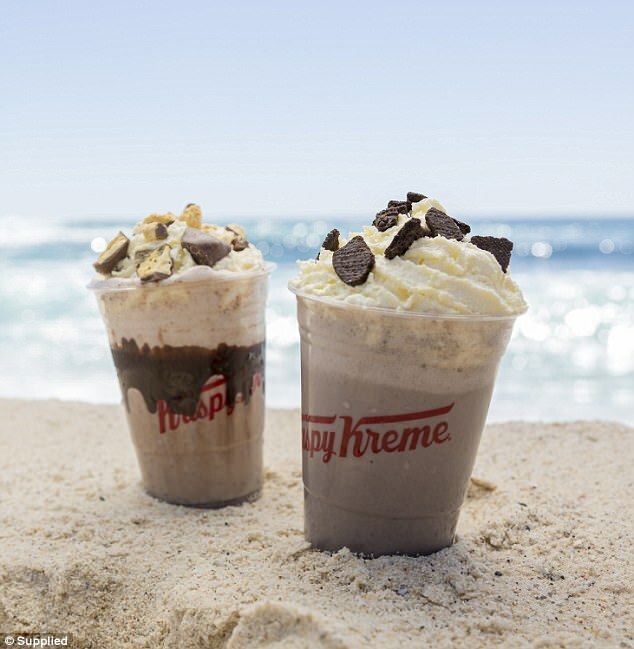 Krispy Kreme hopes the unveiling of their summer drinks menu will rejuvenate the brand in the hopes that people will cool down with a doughnut in drinkable form, you see? Manager Jack Minchin told the Daily Mail Australia, “We have been a popular destination for milkshakes for a long time, and we’ve also seen the “loaded shakes” as a trend”. Krispy Shakes came out today in the land of Oz (January 4th), and one will set you back $6.95 for a regular, and $7.95 for a large. It’ll really give you a much needed calorific boost to your waistline. So, if your body and or wallet can afford to enjoy one, then why not? The question still remains of how something like a Krispy Shake will be refreshing on a hot summer’s day? Anyway, pending a successful sales run, we can expect these to be rolled out in The United States and the United Kingdom some time soon. Their goes your New Years diet fad!